Dads Who Play Barbie Challenge! In life, there are a few things that are guaranteed to put a smile on your face no matter what. If you ask me what makes me smile, my answer is always my family. But, one thing that gives me all the feels is when I see those special moments between my daughters and their dad. As a mom and wife, I consider myself lucky for having a loving and caring man and positive father figure in the lives of our Gabs and Mimi. Not only does he help with homework and projects, prepares delicious meals, helps keep the house nice and clean and so much more. While these are things that most parents do on the daily, it’s those moments where they sit down to create something, read a book, play silly games, learn something new together or play with Barbies. All of these things are fundamental to the positive growth in kids. Creative play can help a child in so many different areas in their lives. 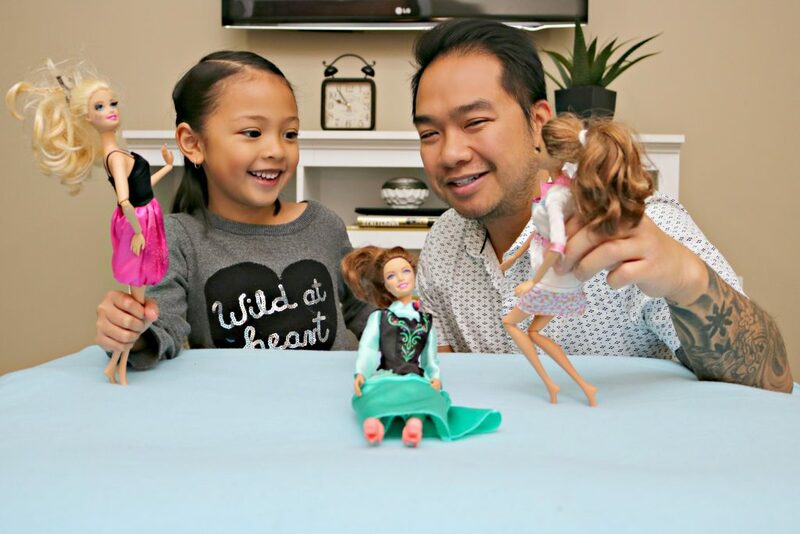 Barbie recognizes the importance of this dad and daughter dynamic and they’ve launched the Dads Who Play Barbie Challenge. 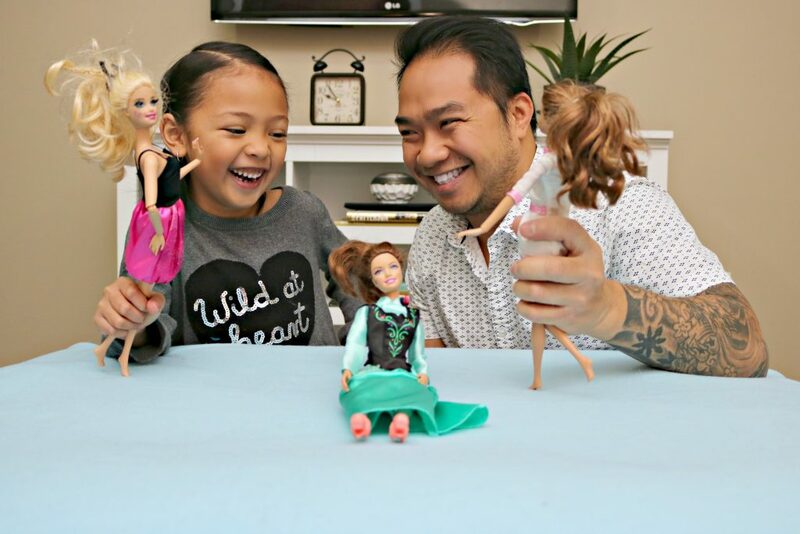 Barbie is calling for all dads and daughters to create a short video of what they love to do together. Whether they bring out the canvases and create a piece of art, play their favourite sport together, get in the kitchen to cook a favourite recipe or yes, even a dad and daughter Barbie playing session! Whether they bring out the canvases and create a piece of art, play their favourite sport together, get in the kitchen to cook a favourite recipe or yes, even a dad and daughter Barbie playing session! Feel free to let your imagination run wild and Mom can even get in on the fun as the videographer behind the scenes capturing that magic! The top four finalists’ videos will be shortlisted and placed on the Barbie YouTube Page, and Barbie fans everywhere can vote on their favourites! Submit a homemade vid of dad and daughter playing together. Need a little inspiration for your submission? Try careers, cooking, sports, fashion, and even make-believe! Top 40 First Prize Video Winners will each receive a Barbie doll and $250! Top 4 Finalists (out of 40 First Prize Video Winners) will also receive a Barbie Dreamhouse! 1 Grand Prize Winner (out of 40 First Prize Video Winners) will receive $25,000 to invest in your child’s future and a trip to Mattel headquarters in Los Angeles where your child can be a Barbie designer! All teams of Dads & Daughters who submit videos will have the opportunity for a chance to win fabulous prizes! Record your vid using a smartphone, tablet, or another kind of camera that records video. Parents must read through and agree to the “Official Rules”. March 17-27: This is the time period you have to get your submission in! April 13: Top 4 submissions will be chosen. April 14-21: This is the time where Barbie fans will vote for their top choice! April 26: When the Grand Prize winner is announced! This contest is only open to residents of the United States, United Kingdom, Canada (excluding Quebec), Australia, Mexico, Germany, or France to be eligible for this contest. Your submission can be in English, Spanish, German, or French and should not exceed two (2) minutes in length. See the full rules and regulations on their website. Now’s your chance to let the world see that magic and those special moments that truly put a smile on your face. You never know, it just may be the one to win the $25,000 Grand Prize! Regardless, it’s a great way to capture those moments to treasure forever. Also, I have to say, there really isn’t anything better than to see a Dad playing with Barbies, right? I can’t wait to see your submissions and I am rooting for one of you to take that prize! Regardless, it’s a great way to capture those moments to treasure forever. Also, I have to say, there really isn’t anything better than to see a Dad playing with Barbies, right? I can’t wait to see your submissions and I am rooting for one of you to take that prize! For further details and to submit your special dad and daughter moments, head over to Barbie’s website. Do you have a dad in your life that plays with Barbies? I have all boys, so there are no barbies here, but I remember my dad playing Barbies with me when I was a little girl. Such great memories. I love this idea! It involves a dad with her kiddo doing something absolutely love. I know not every dad plays with Barbies but I love those that do. This is a great idea! This is so super-cool. I remember spending hours playing barbies and yes, my dad played, as well. He always had the wildest imagination, like Barbie being a Scientist or being a Doctor. LOL. I loved it. Hehe, they have the best Barbie back stories. I honestly can’t think of a better way to encourage and inspire dads to play with their daughters! I loved watching my husband play barbies with our girl-those are the memories our daughters will always keep with them! How fun is this?! My husband has always played Barbies with my daughters and they often choose him to play with over me! LOL, I am with you. I think this is an amazing challenge. My Dad used to play Barbies with us and come to our tea party’s. It is a great way for Dad to bond with his Daughter. My Husband loves to get involved and play Barbies with the kids. We have 3 girls so he is out numbered. Hehe, Darasak is outnumbered too! This is an amazing contest. I don’t know of many dads who actually play Barbies with their daughters but I think more should. So very true. They definitely do exist! My daughter doesn’t really play with Barbies anymore. I’ll have to let my cousin know about this contest. That would be awesome! Thanks for spreading the love. I think this is such a fabulous idea! My husband plays Barbies with my kids all the time and I think it is just the cutest thing. I think it is super cute too! I think this is wonderful. It’s nice to see dads playing like this with their daughters too. It’s so nice for the kids to be able to play with their dads as well. It’s a great bonding experience for both. Super cute. Dads should always be there for their kids. This is a great contest! I wish my girls were still in love with Barbies like they used to be. My husband played for HOURS (cumulatively) with my daughters and their Barbies. This is so cool! Fathers SHOULD do this with their daughters! Girls are amazing and they can play with Barbies or Tonka trucks if they want to. It’s time to stop the gender identification with toys and let kids play the way they want to. When fathers step in and play “girly” toys with their daughters it empowers them to grow into well balanced women! This is so heart warming to see! What great memories for your daughter to play with her dad like this! It makes for great memories, that is for sure. This is just so sweet! I love the idea behind it and I’m sure little girls just love seeing their dads playing with their barbies with them haha! It is a different dynamic. This is such a fun challenge! I love it! Getting dads and girls involved in play together! I think this is an adorable way for dads to spend time with their daughter! It’s such a nice challenge and I’m sure many dads and daughters will have a great time! So cute. Gotta a love a dad who will sit down for a tea party or to play Barbie. I am seeing this campaign everywhere and I am totally loving the idea. It’s so heartwarming – makes me want to buy a new Barbie, too! What a super fun challenge! My husband did this a few times when my daughter was little. This is a great idea to foster relationship of father-daughter. Nice! I passed your post along to my daughter. With a five year old daughter .. she’s knee deep in the world of Barbies and has a great hubby! Such a cute and positive contest! This is a fun challenge! I am going to tell my husband about this, sure he will love this idea! How adorable! My husband plays Barbies with my daughter from time to time. It is such a wonderful way for father and daughter to bond! 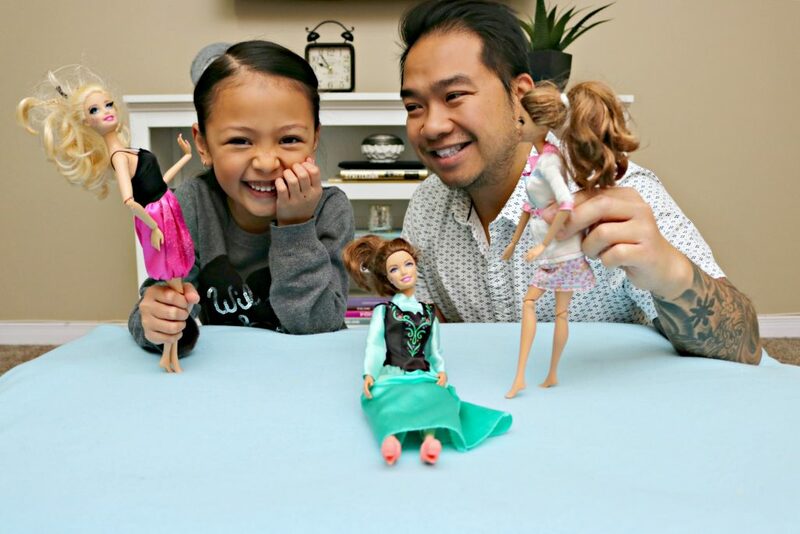 Dads who plays barbie with their daughter are the real dad! They just want to be happy with their daughter. This is awesome! I am so having my husband do this with my daughters! That is aweosome, good luck! I need to find the old videos of my husband playing tea time and barbies with the girls. We are very lucky to have a wonderful Dad who had creative play time with all of his kids. That is amazing, lucky indeed. I love it. My daughter missed out on this opportunity with her dad. It makes me sad but its his loss not mine. I always enjoyed playing with my barbies when I was growing up. That is unfortunate but, I am sure you took his place. She will remember that. I love it – dads that play Barbie. This sounds like a really awesome campaign! Some dads are just so cool. I wonder if I had a girl if my husband would play barbies with her. Haha! I play trains and cars with my boys so it would only be fair! I think it would be then! Me too, it is a happy thing to see. This is so cool! This is about an Elektra feature of a dad-daughter relationship. What a cute contest! My daughter loves to play Barbies with her Dad! Too bad we do not have enough time to enter. Hehe, it is! Dads who play with Barbies rock.